I get up when I want, except on Wednesdays when I get rudely awakened by the dustmen. I put my trousers on, have a cup of tea, and I think about staying in the house to build sewage plants all day. Ahh, this is it. Must be Cities: Skylines – Parklife. 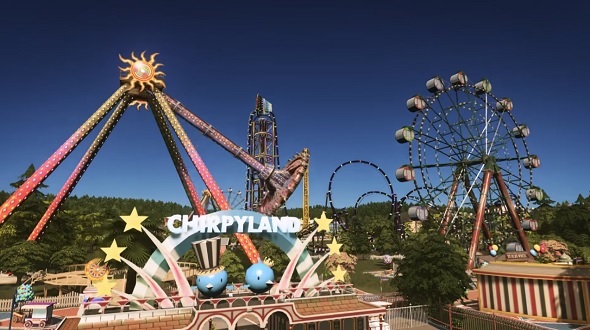 Cities: Skylines has had a number of great expansion packs since its arrival in 2015 that help to sell the feeling that you are mayor for a day. From traffic management to natural disasters, there isn’t much this game doesn’t offer you in the way of proper city simulation. And now your council has a new department: parks and recreation. For more like Cities: Skylines check out the best building games on PC. Not too long ago, I wrote about the Green Cities expansion pack, which was music to my vegan ears. So you can understand my excitement when I heard about a parks expansion. Then imagine the expression on my vegan face when I realised it added the possibility to create zoos – even if I have a problem with them outside of games. And, who knows, perhaps this expansion actually raises questions around the ethics of zoos. Of the few parks I’ve built since giving Park Life a go, I’ve only built one zoo. As you can imagine, I cooed over the animal enclosures in a very conflicted way. Aww, there’s a monkey palace! Aww, look at the flamingos! It’s great to see the animals flapping around in their bright colours but the metal bars around them put a downer on the entire experience for me. Along with the zoos, the Park Life expansion introduces eight new policies, one of which is an Animal Ethics policy. The Animal Ethics policy allows you to give zoo animals extra care and more activities to keep them “happy and entertained.” The simple existence of the policy flags up the ethical problems of zoos and even suggests to players why zoos aren’t ethical by default: this policy costs you ten bucks of in-game currency per zoo building. That is a fair amount if you’re trying to turn a profit. In a similar way to the game Sweatshop, if your goal is only to profit, then you’ll have to make sacrifices along the way. There is a plus side to this policy but it’s not at all beneficial to the animals – the entertainment effect it has on zoo buildings is boosted by 20%. Bargain. Do it for the entertainment. That’s all animals are good for, right? Having a policy that gives you the chance to turn the zoo into an animal sanctuary, or to have it act primarily as a means of animal conservation – with the hopes of rehabilitating zoo animals – or protecting endangered species would be a good way to combat the view that zoos are only good for profit and entertainment. But Cities: Skylines: Parklife doesn’t go in this direction. Another route would be to have picketers and protesters encouraging citizens to boycott the zoo unless it changes its policies to become more animal-friendly. I’ve my fingers firmly crossed that Skyline’s active modding community will pick up the slack on this issue. 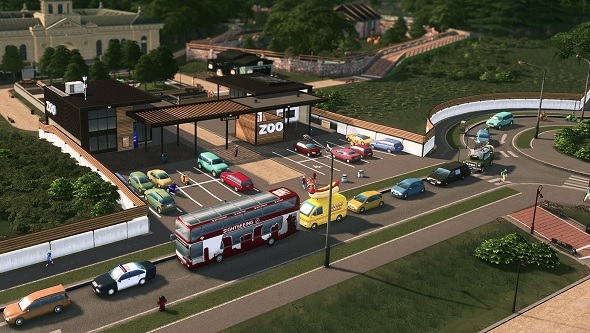 Outside of adding zoos, Parklife brings the opportunity to create new park areas – turning empty land into something profitable – with new assets, a new sightseeing bus tour, new unique buildings, and the possibility to place buildings next to paths, not just roads, in these park areas. I live in hope that they’ll bring these features to areas outside of parks one day, too. A pedestrianised high street is a dream that doesn’t feel so far fetched now. Developer Colossal Order keep on coming up with extra content that fills a hole in Cities: Skylines that you didn’t even know was missing. But it still feels as though it’s missing something. Buildings that attachto paths, for starters. And, now that I have all of my nature reserves, green energy resources, and concerts, Cities: Skylines could really do with an updated UI – something to keep this three-year-old game feeling current. That’s an energy joke for you fellow mayors.